We all use product ratings and reviews in the process of deciding which product to buy. And, we all want products that get a 4-5 star rating, but a recent analysis by The Washington Post found that more than half of product reviews on Amazon in some electronics product categories are fake or compensated. It's time-consuming to read through all of the reviews to see if the rating is falsely inflated. That's where review-rating sites and tools, like Fakespot, ReviewMeta, and The Review Index, come in handy. 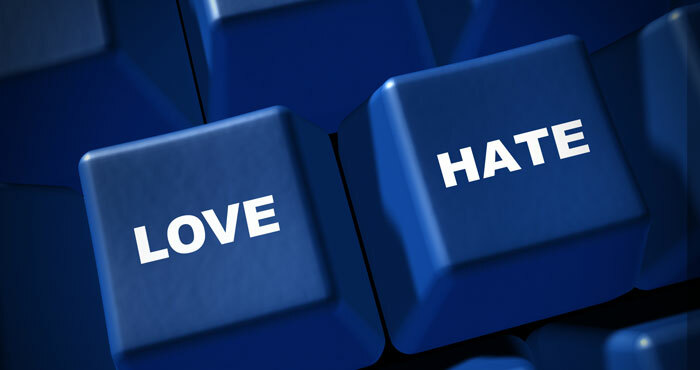 They automatically scan posted reviews for the telltale signs of fake reviews, analyzing spelling, grammar, number of reviews, purchase patterns, and more, and let you know the likelihood that there are fake reviews inflating the rating. The tools support their review ratings with data from their analysis, so you can judge how important their findings are, and Fakespot and ReviewMeta present an adjusted star rating. The review ratings can be outdated, so be sure to check the date on the report and rerun the review analysis if it's more than a week old. If the report is really old or a report has never been run, the tools will let you know. Keep in mind that the tools are not infallible, but they will help raise your awareness of when you should be skeptical of a rating and read a product's reviews more closely. Fakespot has an easy-to-use letter grading scale with A and B meaning that you can trust most of the reviews, C meaning there is a mix of fake and trustworthy reviews, and D and F meaning most reviews are unreliable. 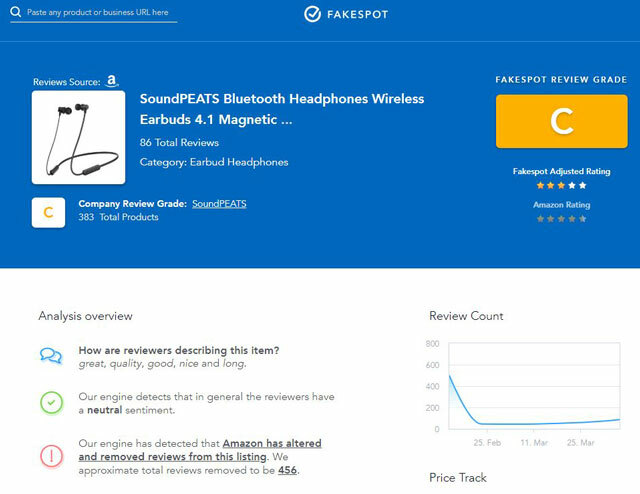 Fakespot backs up its grades with data they use to come up with the grade but doesn't go into how they judge review quality. In addition to the grade, they provide a summary of the reviews, pulling quotes from what they consider to be the most relevant reviews. 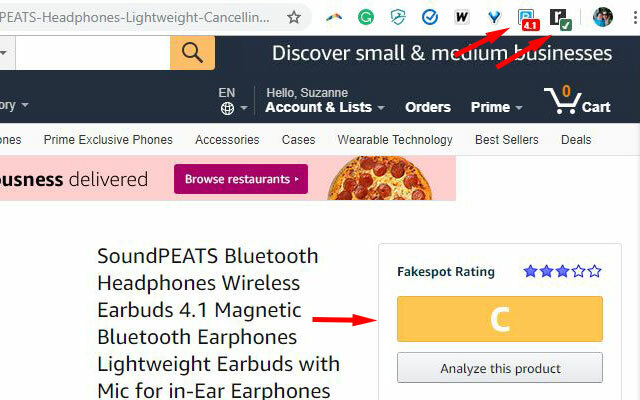 The review rating appears prominently on Amazon pages once you have installed the Chrome browser extension, but for other supported sites, you'll need to input the URL at Fakespot. Besides Amazon, you can input URLs for products on Best Buy, Sephora, Steam and Walmart, as well as listings on Yelp and TripAdvisor. 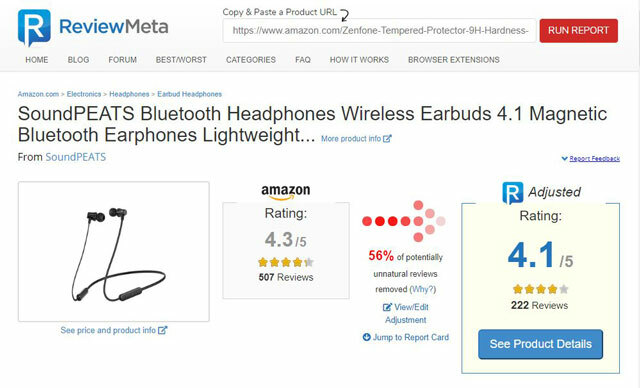 ReviewMeta provides an adjusted product rating for products sold on Amazon, based on the reviews it deems are real. If you install the browser extension, you'll see the product rating in the address bar superimposed on top of the ReviewMeta icon. ReviewMeta provides a lot of detail supporting its revised rating. It shows how the ratings failed and where they passed, as well as the data they used to come to those conclusions. You can also read a sample of what it considers most trusted reviews and the least trusted reviews. ReviewMeta is available as a Chrome, Firefox, Edge or Safari browser extension or you can cut and paste the URL at ReviewMeta. The Review Index provides an easy-to-read numerical review score out of 10 points for product pages. The site also does a nice job of summarizing review comments based on features. 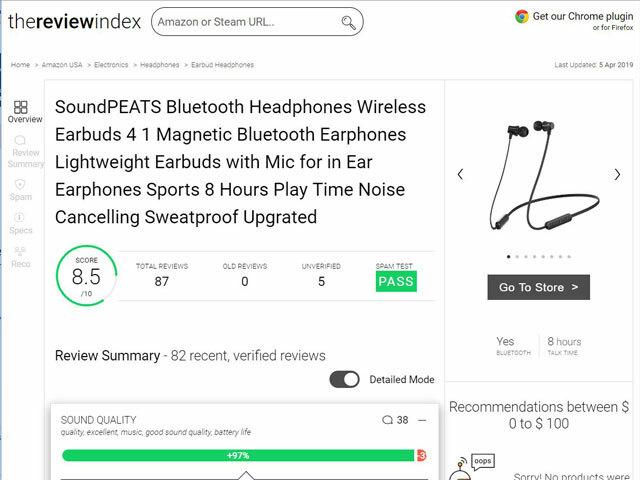 So for headphones, you'll be able to see a percentage of positive reviews by feature and read the comments on sound quality, fit, and more all in one spot. The Review Index spam test judges the quality of the reviews based on factors like review count per reviewer and how many reviews a reviewer writes per day. In addition to Amazon product reviews, The Review Index assesses reviews at Steam. Get The Review Index Chrome or Firefox browser extension or input the Amazon or Steam product URL at TheReviewIndex.